Heat the oven to 400°F. Stir the mayonnaise, cheese, onion powder, garlic powder, black pepper, spinach and artichoke hearts in a medium bowl. Unfold 1 pastry sheet on a lightly floured surface. 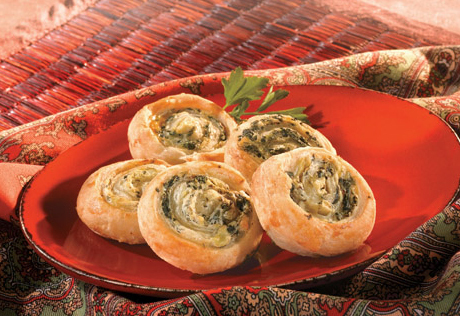 Spread half the spinach mixture on the pastry to within 1 inch of the edge. Roll up like a jelly roll. Press the seam to seal. Repeat with the remaining pastry sheet. Cut each roll into 20 (1/2-inch) slices, making 40 in all. Place the slices, cut-side down, onto 3 baking sheets. Bake for 15 minutes or until the pastries are golden brown. Remove the pastries from the baking sheet and let cool on a wire rack for 10 minutes.